For the most part, my pregnancy was healthy. I gained very little, ate a good diet, and felt great. When I was 33 weeks, I started feeling a lot of back cramps that came in contraction like waves. Over the week, it increased. I was put on antibiotics to stop a potential infection, but it did not work. When I was 34w5d, I began having contractions regularly every 3-5 minutes. This continued on despite position changes, drinking fluids, etc. I went into the center and was 1cm dilated. I was put on the EFM where it picked up contractions every 3-5 minutes. My midwife gave me 3 shots of terbutaline and prescribed me terbutaline to take orally at home. I had a few days of relief, but by my next weekly appointment, the contractions were back in full force. They switched my medication and hoped it would get me through the next 9 days so I could deliver at term. The contractions never went away. Although not intense, I contracted around the clock every 5-10 minutes. The following Tuesday (I was 36w3d) the contractions were building in intensity, coming every 3-4 minutes and lasting a minute long. Back to the birth center we went. I was 2/40/-2. My midwife gave me a shot of vistral that burned like fire and was suppose to make me sleep. After I finally fell asleep, I woke to contractions still coming every 5 minutes. I had my weekly appointment 2 days later. I was 3/60/-2. Saturday was 37 weeks! I woke up Saturday at 4am cramping and contracting every 4-5 minutes. These definitely felt different than the other contractions I had been having. I went into the center to get checked by midwife at 9am. I was 4/60/-2. I was told it could be a several hours or a day or two before things really kicked into high gear. My inlaws decided to go ahead and take Cephas and Gideon to their house in case we were back at the center in a few hours or during the night. We didn’t feel like going home to sleep. It was 10 in the morning and decided to stop at the AMC30 on the way home and see if there was any movie we wanted to see to keep us distracted. We bought tickets for The Blind Side. I contracted every 3-4 minutes through the whole movie. We came home and walked the subdivision and ate a burger. I was getting pretty discouraged. After the weeks of preterm labor I was ready to have him already! Around 3:30, I decided to lay down and listen to my hypnobirthing cd to see if it would help me rest and relax. The doula in me knew if things did not stop or progress quickly, we could be at this through the night and I would need my energy. I finally went to sleep. I took a 45 minute nap and woke to my contractions coming every 2-3 minutes, and stronger in intensity. I labored on the birth ball awhile and walked and the contractions did not change. After an hour and a half of contractions like this and Christopher freaking out that we were going to have a baby in the van (I knew it wasn’t time, but he was nervous), I called my midwife. She said for us to come to the center with all of our stuff and we would have a baby one way or the other. We got to the birth center at 6:40 Saturday evening and settled in our birthing room (the same room where Gideon was born.). My midwife took my vitals and checked my cervix. I was 5/70/-2. She gave me options to get labor moving along (cohoshes, pregnancy tea, AROM) and I said “just break my water.” Okay really bad thing for a doula/midwife apprentice to say, but hey I was done with labor and needed to have a baby. Breaking my water did help move things along. I labored on the birth ball awhile and then walked around the birth center. Walking brought stronger, closer contractions. While walking, Christopher decided to eat something and I was really shocked that it did not make me nauseous or want to throw up as I anticipated being sick after getting so sick during Gideon’s labor. I was starting to get fairly uncomfortable and wanted to get in the water, so I asked to be checked. At 9pm, I had progressed enough to get into the water and what a relief. Contractions were strong and close in the water and I was having a harder time focusing. I did not want anyone to talk or make any noises. Jaymee, one of my midwives, did counter pressure during contractions and it help the back labor immensely. Transition brought on the dreaded nausea and vomiting that I was hoping to avoid. I soon started to feel pushy and my midwife told me to check how far he was. I felt him at my second knuckle. She checked me and said he was close, but I was 8cm and would need to give it a little bit longer to finish dilating before I could push. She had me lean back in the tub to help Silas to rotate (he was LOT at the time) and to dilate the last of that cervix. My body obviously did not like the position (although it was a position that I needed) and I started vomiting again. After a couple of contractions, I leaned over the tub again, which was the only position that gave me some relief. Within minutes I was feeling the unbearable urge to push. Being 37 weeks, I anticipated another 6 pounder and was not expecting for pushing to hurt since it did not hurt with Gideon. I had an anterior lip that my midwife reduced. Pushing was painful and burned. I screamed. I was taken off guard by the burning and was not prepared for it. My midwife had to refocus me. One I was focused, I was able to do this and pushed him out. 15 minutes of pushing brought Silas Ebenezer to us. He was born in the water at 11:02 pm. As routine for all deliveries, the oxygen was out and ready in case of resuscitation. Although he maintained an excellent heart rate the entire time, he was limp and not breathing. They administered homeopathics to him while he lied on my back. It didn’t help. He had to be PPV’d for what seemed like an eternity. I remember being told to talk to my baby. We called his name. The cord had to be cut so that they could work on Silas more efficiently. He finally took his first breath and started to cry. He was kept on blow by oxygen for quite awhile after delivery to help him through transition. During examination of the cord and placenta, it was discovered that Silas had a true knot in his cord. The combination of the nuchal cord and true knot seemed to have been “suffocating” him while I pushed. We were so thankful and praised the Lord that Silas came when he did and did not stay in utero longer. If the knot would have tightened, he potentially could have suffocated. I moved from the tub to the bed in time to deliver the placenta. I had a first degree tear that had to be repaired and then I got to hold Silas. Silas, like Gideon, refused to breastfeed at the center, but I was determined and armed for the potential problem. 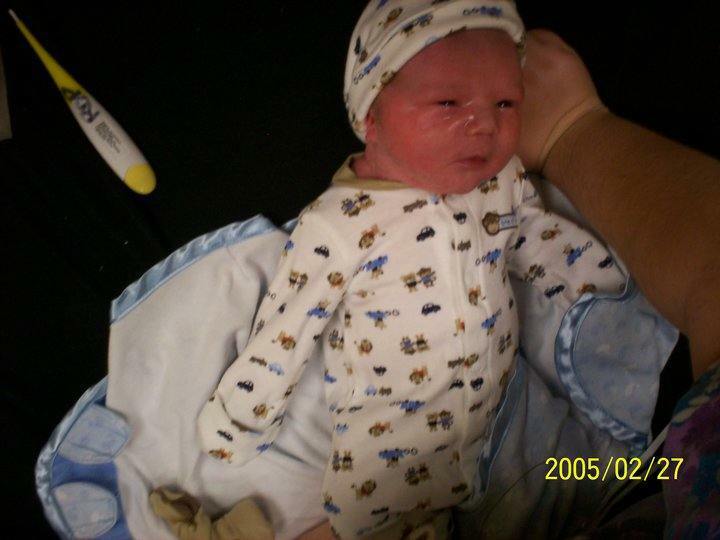 We gave him 5cc of formula in a tube to help his blood sugar at 2 hours postpartum. He latched like a champ once we were home. Silas was 19 inches long and weighed 7 pounds 13 ounces, a pound and a half bigger than Gideon and Silas was THREE weeks early! At 3:30 am on Sunday, we were discharged and went home. I had another beautiful water birth with Silas and am thankful for the lovely experience.